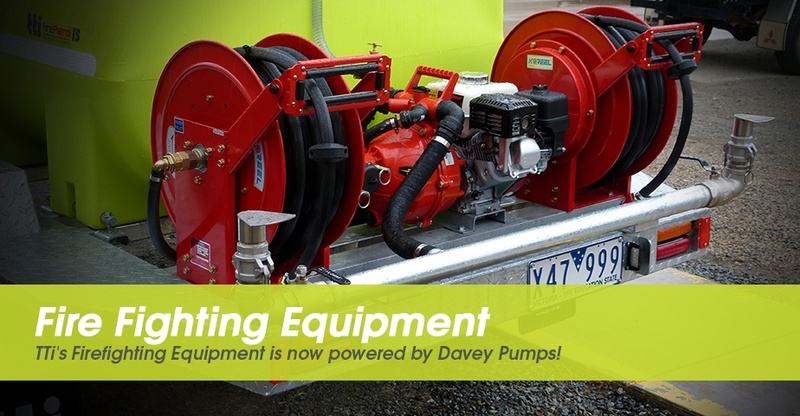 TTi’s Fire Fighting Equipment is now powered by Davey Pumps! Australia’s safest portable firefighting equipment has just become even more reliable with the announcement that Trans Tank International’s most popular units will now be powered by Davey Pumps. The Australian designed and manufactured pumps will come as standard on the following ranges from TTi. TTI General Manager Ross Buchner said the new partnership with Davey had been struck to ensure TTI continued to be Australia’s No.1 supplier of the safest and most efficient firefighting equipment. When you combine one ofTTI’s Australian built transport tanks with a Davey firefighting pump, you have a package that you can absolutely rely on to protect what matters most to you. “A couple of our team recently toured the Davey manufacturing plant in Melbourne, and we know that Davey shares the same attitudes towards safety as TTi and they are living out those values,” he said. With high quality Honda engines, Davey pumps can be trusted to start first time, every time. “The last thing you want is your firefighting pump to let you down during a fire because it’s too late to have regrets then,” Mr Buchner said. “Everyone knows that genuine Honda engines start first time every time,” he said. With a harsh environment and a sometimes unstable climate, Australians have never been more aware of the threat of fire on rural properties. But fast responses from properly equipped private landowners have brought many threatening fires under control before the arrival of the fire brigade. Throw in the fact that private equipment also significantly assists in blacking out and patrol after fire and it further underlines the value of having your own fire protection assets.